Guatemala struggles to resolve the memory of its past civil conflict while facing challenges like widespread poverty, child malnutrition and violence. Weak institutions and insufficient government investment in education, health and social programmes make it difficult for children, young people and families to get the support they need. Children who have lost parental care can find a new home in an SOS Children's Village (photo: SOS archives). Guatemala is home to about 16 million people, making it the most populous country in Central America. It also has the highest birth rate in Latin America, and the youngest population; nearly half of Guatemalans are under the age of 19. This youth, combined with a high birth rate, means that its population will most likely continue to grow. During the second half of the 20th century, Guatemala was governed by a series of military and civilian governments and experienced a 36-year civil war. During the conflict more than 200,000 people were killed, and, according to some estimates, nearly one million fled as refugees. A peace accord was signed in 1996, but bringing individuals responsible for crimes during the war to justice has been a slow process. In 2015, the people of Guatemala called for changes in the government due to the high levels of corruption. Corruption had been present up to the highest levels of the ruling administration. In spite of recent efforts, its effects continue to be felt in Guatemala's weak institutions, powerful organised crime networks and pervasive violence. Guatemala has one of the largest economies in Central America, but only a small amount of money is spent on public services. It is one of the most violent countries in Central America, and in addition to creating an environment of fear and insecurity, the high rate of violence and crime generates huge economic costs. Insufficient resources are spent on strengthening institutions, like the court system, and offering support to vulnerable groups, like women and children affected by poverty and violence. Inequality remains a major problem. Nearly 60 percent of the population – or about nine million people - live below the poverty line, while about 23 percent - or roughly 3.7 million people - live in extreme poverty, meaning they live on less than two dollars a day. Indigenous communities, which make up 44 percent of the national population, are disproportionately affected. Almost 80 percent of indigenous people in Guatemala live in poverty, and many rural areas lack access to water and proper sanitation facilities. Guatemala’s booming population is quite young, with more than seven million children under the age of 18. There is a high prevalence of violence against children. In addition to physical and sexual abuse, trafficking is also a danger. Almost 50 percent of Guatemalan children suffer from chronic malnutrition, one of the highest malnutrition rates in the world, and 47 out of 100 children are below the average height for their age. Over 12 percent of children are underweight. Children living in rural areas and children from indigenous communities have a stronger likelihood of experiencing malnourishment. In 2015, nearly 200,000 children and young people dropped out of school, with malnutrition cited as a common reason. When children don't get enough to eat, they are in poor health, tired and find it difficult to concentrate in school. Additionally, Guatemala has the one of the highest rates of child labour in the Americas: nearly 26 percent of children between the ages of 5-17 are engaged in work that is mentally, physically, socially or morally dangerous and harmful. SOS Children’s Villages has been present in Guatemala since 1976. Strengthening families: We work with local organisations to support families who are at risk of breaking down. Each family needs different help and, among other services, we offer material assistance so that children can receive nutritious food and go to school. We also provide counselling and training so that parents can care for their families. 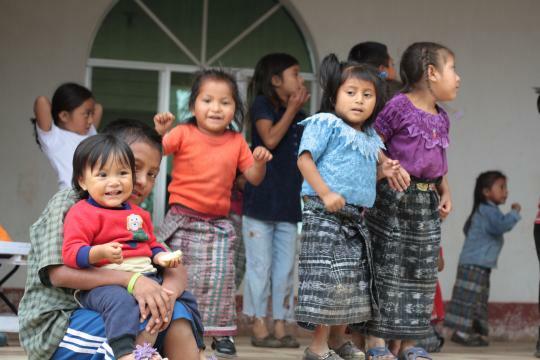 Care in families: If, in spite of all assistance, children can't live with their families, they find a new home in the care of SOS Children's Villages In Guatemala, we offer different forms of care according to the needs and best interests of each individual child. These include SOS Children’s Villages, where children live in a community made up of other SOS families, but can also include foster families and SOS families that live in local communities. While the children are in our care, we work with their families of origin, so that they can, wherever possible, all live together again. Support for young people: The high level of violence, poverty and lack of opportunities make it difficult for young people to become independent. We provide young people who have lost parental care with support and training until they are able to live independently.